Over the past five years, the biggest North American airlines progressively installed Wi-Fi to improve connectivity on board their domestic fleet. Today, most of them charge for internet access with the exception of JetBlue Airways which provides complimentary access for their passengers. In 2018, a new trend is brewing as airlines expand or introduce free messaging on board. Experience The Skies reveals which North American airlines are participating in this trend and where is it heading next. Messaging – What Is it? Messaging (also called electronic messaging) is the creation, storage, exchange, and management of text, images, voice, telex, fax , e-mail, paging, and Electronic Data Interchange (EDI) over a communications network. Over the past three years, standalone messaging applications took the lead from traditional telecom managed Short Message Service (SMS) as the most popular method of communication between users around the world. The most popular standalone messaging applications by daily active users in the world are: WhatsApp, Facebook Messenger, WeChat, Line and Viber. The first two applications owned by Facebook Inc., are also the most popular in North America. When it comes to hybrid messaging / SMS tools, Apple’s iMessage and Google’s Hangout/Allo are the most popular when factoring in their high user bases. In a Pew Research Center research piece on social media engagement, it is noted that more than 55% of smartphone owners use some form of messaging applications. 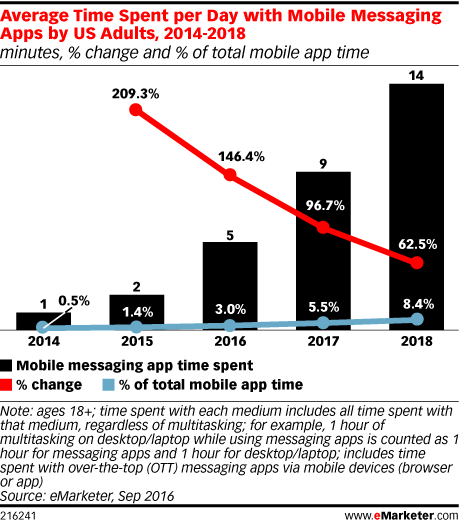 eMarketer separately reported that the number of minutes per day spent on messaging and as a percentage of total time spent on mobile applications will jump 1400-1600% respectively from 2014-2018. Airlines had always invested in on board connectivity. Delta Air Lines was the US airline to offer public air-to-ground telephone system with Airfone service on board in the 1980s. At the time, per minute charges ranged from US$3.99 to more than US$10 depending on the number being dialled. Internet access first became popular when Connexion by Boeing was installed for use on many major carriers’ international long haul fleet in the early 2000s. North American airlines led the way in connectivity development since the beginning. Most of the them now have Wi-Fi installed on both much of their domestic and international fleet. The most popular vendor choices are from GoGo and ViaSat. The following is the list of major North American airlines and whether they have Wi-Fi connectivity available as at July 2018. Within this list, only JetBlue Airways provides complimentary Wi-Fi access to all customers on board. Alaska Airlines and Delta Air Lines now offer complimentary messaging (which includes access to iMessage, Facebook Messenger and WhatsApp) to customers while American Airlines announced it will do the same sometime in 2018. While not completely complimentary, Southwest Airlines’ customers can use iMessage and WhatsApp for US$2 per day. In order to send messages on board, customers only need to download their preferred messaging applications in advance, access the in flight Wi-Fi connection once the flight is above a certain threshold (typically 10,000 feet) and start communicating for the duration of the flight. The only major drawback is that messages will only support words and emojis. Sending pictures, videos or other contents may not be supported. On airlines where internet access is not complimentary, customers are encouraged to purchase access during the booking process to save money over buying the connection on board. Additionally, United Airlines and Gogo affiliated airlines each have their own monthly subscription offers in place to attract customers with lower pricing. 2018 is the year airlines provide some form of internet access to an extended set of customers. Within a competitive domestic market, access to complimentary messaging and internet access on board may sway potential customers in choosing one airline over another if price, route and timing are the same or similar. This competitive advantage may have a stronger influence on longer flights where complimentary access to external communication is more appreciated and desired. Airlines that offer this service can promote this service more prominently on their sales channels, across their social media channels, and third party booking sites. There is a higher probability that other North American airlines would add complimentary messaging in the near future to competitive reasons. What About Complimentary Internet Access? RouteHappy reported recently that while there are 82 airlines worldwide with Wi-Fi equipped aircrafts in their fleet but only 10% of them are providing free internet access. This may change as airlines find new ways to attract customers just like hotels and airports did. 10 years ago, most North American airports and hotel chains had a pay per use internet access model. As price of delivery drops due, they turn into a freemium model (i.e. complimentary lower quality access for all travellers but offering a higher quality access for an additional cost). Infrastructure, operating and maintenance related costs continue to play a big factor in prohibiting many North American airlines in offering complimentary internet access. Limited Access – Introduce an ad based tier. It is important for airlines to vet these ads and make them relevant to the travel experience or risk negative feedbacks. 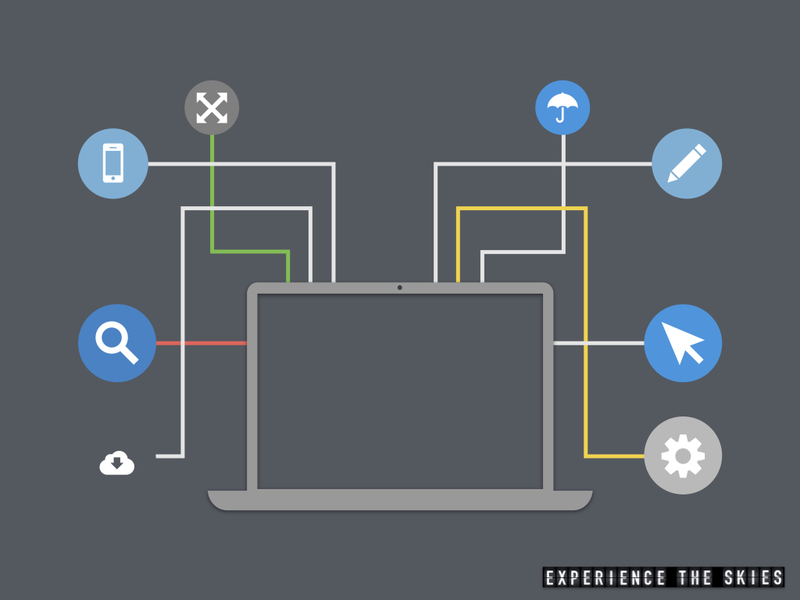 Alternatively, airlines can ask customers to visit a company’s website before providing access. Any airlines that do not provide complimentary internet or messaging options should allow customers to access its travel portal or mobile applications to receive information the latest flight information. Full Access – Provide a lower speed/capacity tier for all customers similar to the concept created by hotel chains currently. Additional ancillary revenue can be made by selling one time or subscription access to higher speed / capacity service based on customers needs. Unlimited Access – Reward loyal frequent customers and those flying in premium cabins or at a higher fare. The costs can be covered as part of marketing, imbedded cabin service costs or airline loyalty program outlays. External Partnerships – Selective T-Mobile mobile subscribers have access to 1 hr or unlimited use of internet on board Gogo equipped flights. Airlines would not have to pay for data used but would have maintain availability. 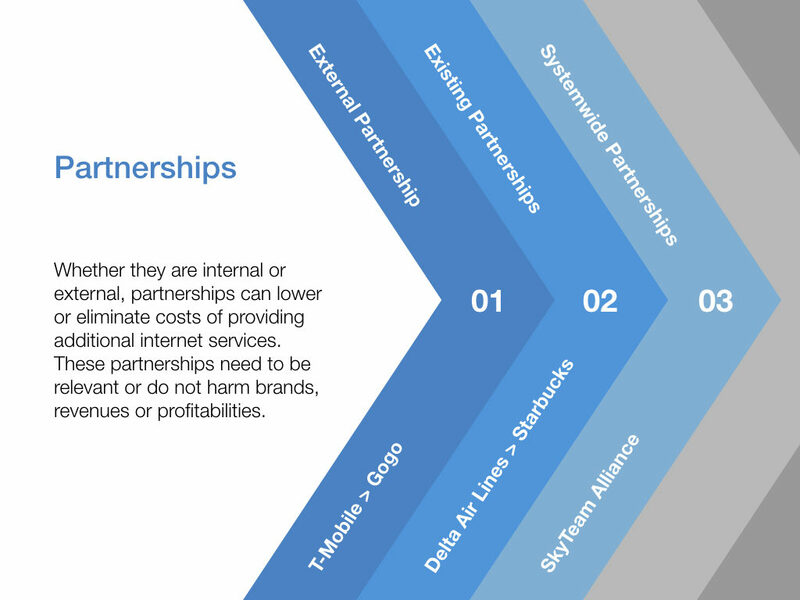 Existing Partnerships – An airline such as Delta Air Lines can approach its worldwide coffee supplier, Starbucks, to subsidize costs as the latter already provides free internet access at many of its coffeehouses worldwide. In exchange, both can expand their co-brand marketing efforts. Delta Air Lines can provide unoccupied real estate spaces in say airport lounges to display Starbucks products and both can enhance the use of customer intelligence to delivery a better experience. In the same capacity, American Express can leverage its relationship with Air Canada, Delta Air Lines and JetBlue Airways and subsidize internet access for its high end credit card holders on board. 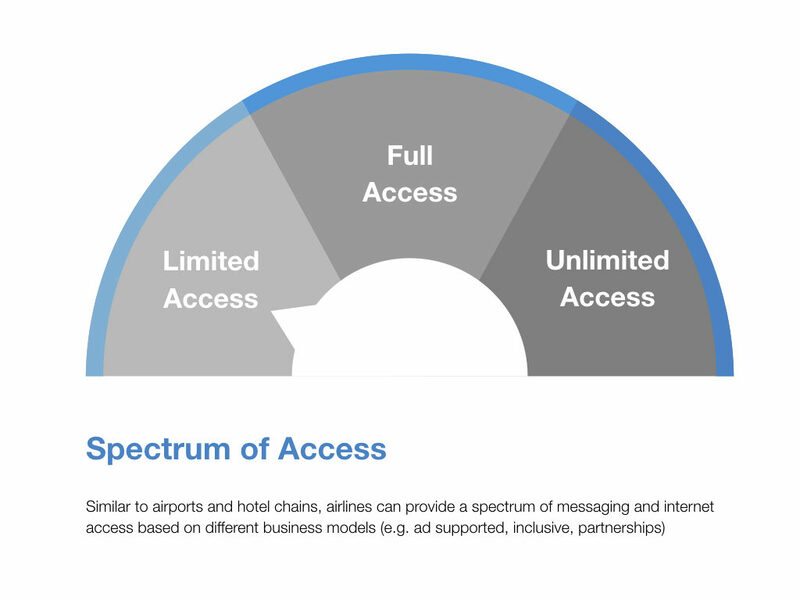 Systemwide Partnerships – Airline alliances such as SkyTeam may also explore purchasing internet bandwidth and capacity on behalf of all its members in bulk to obtain lower pricing per unit. Southwest Airlines has been rolling out complimentary messaging on flights since August 2018. Customers can find out if their flights are eligible by checking the airline’s in-flight entertainment portal on their mobile devices. Those who purchased the US$8/day internet pass and Rapid Rewards A List Preferred members will continue to have complimentary access to messaging. Larry Leung is the Director of Research and Strategy at Experience The Skies. He is a certified avgeek, a public speaker and a dessert and design enthusiast. Contact him through LinkedIn or Twitter. Experience The Skies is a consulting company based in Toronto, Canada that specializes in the travel industry with focus on the assessment, competitive analysis and development of loyalty programs, technologies, marketing, ancillary revenue solutions. Follow Experience The Skies on Twitter, Facebook, Flipboard, and Instagram.